Green factor: No composting or recycling. Recyclable/re-useable containers. After hearing tales of delicious lunches at the dumpling truck my sister was mildly addicted to, she shot me a message last summer to meet up for lunch and finally give these bundles of joy a try. From what my elder sibling told me, their current state of affairs reflects a gradual progression over the few years that they’ve been open. 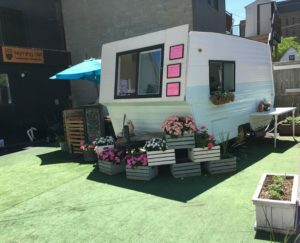 Located behind the Morning Owl on Rochester, a small white camper trailer is parked on a patch of green AstroTurf™, thus completing the G-rated “park” double entendre. Planters, crates, and tin buckets with flowers in them brighten up the space and add a quirky/rustic vibe certainly well beyond your typical parking lot – or at least the ones I’m used to. An owl perched on their décor pays homage to their landlords. Given the location, there was a surprising amount of seating, with room for over a dozen patrons at a few small tables and a bar counter. The menu is lean and mean, with a couple different dumpling bowl options, and a noodle bowl (they have since nixed the salad that they offered last summer). Having just eaten breakfast before the unexpected call for lunch, I kept things light and went with the small dumpling bowl ($10, taxes in). It comes with zucchini “noodles” and six dumplings, and I also got a second order to take home for my wife to have when she got off work. We paid up (cash only!) and shuffled off to the side of the turf to await our food. With only two or three people in front of us, and a pile of dumplings ready to go on the grill next to the trailer, we soon had our food in hand. We gave the dumplings a splash of soya sauce and sriracha at the condiment stand and grabbed chopsticks (forks are also available for the uninitiated); snagging a couple of seats recently vacated by earlier lunch-goers, we dug into our food. Their dumplings are on the small side, but were nicely crisped all over from their time on the flat top. The pork filling was moist and tender, and had a nice pop of flavour from green onion. While normally I’d find zucchini noodles eye-roll-worthy in the modern battle against carbs, here they’re a welcome vegetable in a dish that would have been purely carbs and protein if they were regular noodles. I have been known to partake in such meals, but they aren’t the best for you, and even less so if you’re one of the nearby civil servants who has an afternoon of work in front of them. The noodles had a pleasant hint of crispness to them, and were easily handled with the chopsticks. A slice of colourful pickled radish added a tangy pop, and I’d suggest doing what my Dumpling Park-pro sister did, and ask for extra. On another visit, during 2018’s food truck season, I was able to try out their “mega” dumpling bowl ($13), which ups the dumpling count to ten, and adds jasmine rice to the mix. It was my first real meal of the day, so the upgrade was not only doable, but necessary. The dumplings were once again well executed – their thin-ish wrappers were nice and crispy, and the filling moist and flavourful. The rice was also properly cooked, and was easily eaten with chopsticks – not at all mushy. 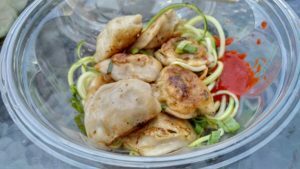 Speaking of mushy though, the sauce and/or juices from the zucchini noodles can lead to the undoing of the dumpling wrappers, although that’s a minor complaint. All told, these folks are really hitting it out of the park (sorry, I had to). 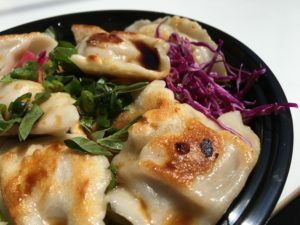 Dumpling Park is pumping out their namesake dish to steady crowds with quality still intact, and fills a niche in a neighbourhood that doesn’t offer the same sort of lunch selection that is available downtown. 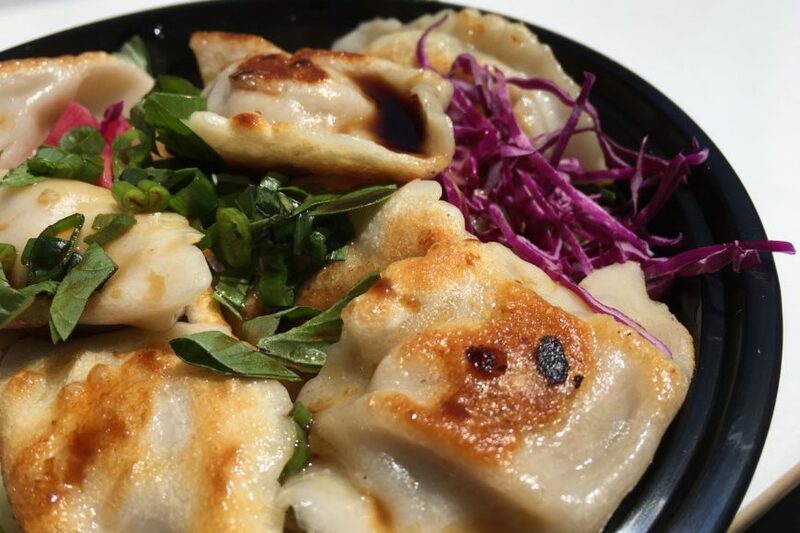 With super friendly staff, and tasty food, Dumpling Park brings a quirky flare to an otherwise staid neighbourhood, and they deserve that you spend a few of your hard-earned bills there.